Kiev market hall, originally uploaded by apamobil. 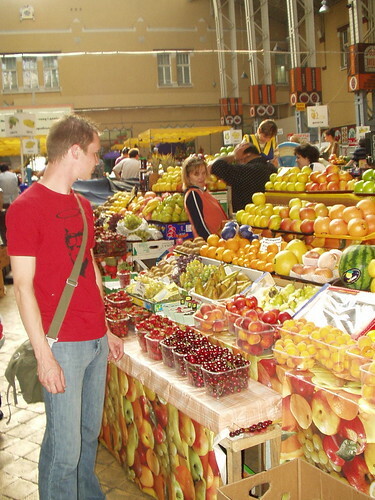 The average monthly pay in Ukraine in March 2008 was $340, or up by $36 from January 2008, the State Statistics Committee of Ukraine said May 5, 2008. As of March 2008, the leaders include Kyiv city, a capital of Ukraine ($600), Donetsk ($400), Dnipropetrovsk ($360), Zaporizhia ($340), Luhansk ($335), Sevastopol ($330), Kharkiv ($310), Poltava ($308), Odesa ($308), Crimea ($303) and Lviv ($300). The lowest average salary was recorded in the Ternopil region ($240), Vinnytsia ($245) and Kherson ($249). In other Western Ukrainian regions the average pay in March 2008 was $290 in Ivano-Frankivsk, $297 in Rivne, $262 in Zakarpattya, $264 in Chernivtsi and $262 in Lutsk.